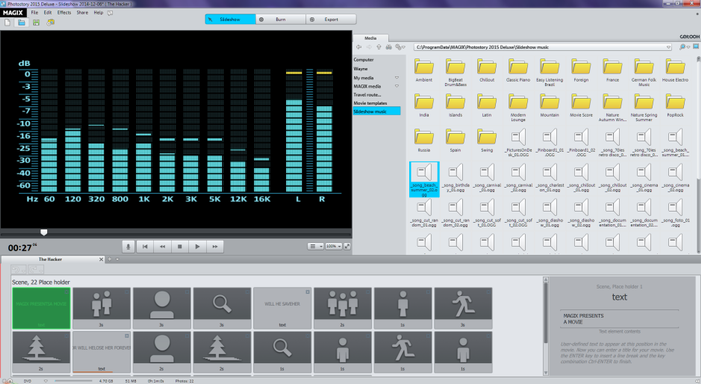 With 8 "tracks" to cater for complex audio and visual set-ups but with a scalable timeline and large preview area to allow for fine tuning, Magix Photostory 2015 Deluxe does exactly what it says on the box - allowing people to 'Make moving picture stories without any previous experience'. Its key aim is to allow the user to orchestrate video and slideshows that are above the mundane. 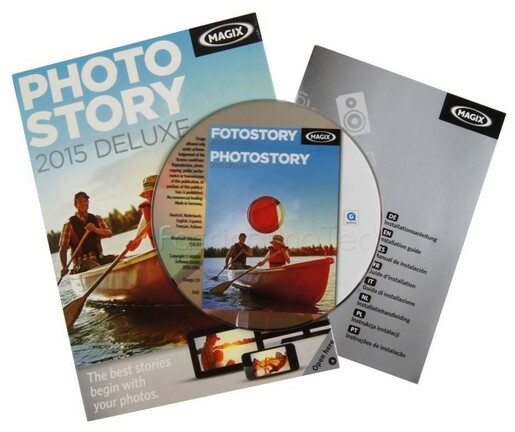 Even without prior experience of slideshow making, or Magix software specifically, the application is intuitive enough to produce output in a relatively short amount of time and without a steep learning curve. There is a wealth of templates, transitions, titling effects and audio clips to cater for most beginners needs, and with the ability to upload your own soundtracks or record audio directly onto the timeline, it should also cater for the enthusiast as well. It's not without a few annoyances but as a start point you can't go too far wrong. 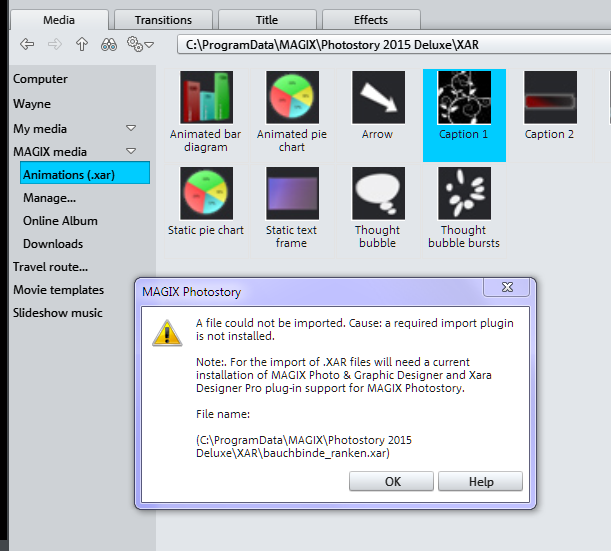 Bundled and optional, but defaulted to "Yes, install"
If you have used Magix software (musc maker etc...) before then the interface will look familiar. Even without prior knowledge of this type of product, the interface is simple and clean with enough space provided for each of the 4 key sections and associated menu functions \ buttons. The software leads you through the creative process easily enough with a "Create \ Edit \ Export" approach that is expected and common for this sort of editing software. Additional functions and options appear on a right click on certain elements, such as on a slide or transition, or when selecting the Edit \ Burn \ Export quick menu buttons. 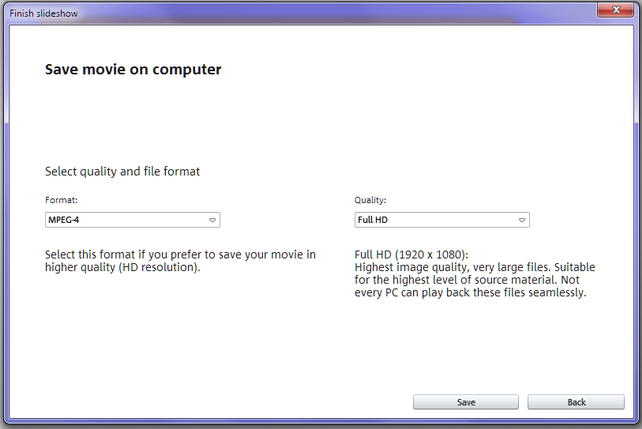 In addition, when certain elements are selected (such as a title) additional dialogues will be presented in the "media" section on the right of the screen, or as a pop-up. A number of these have default values and outcomes while others can be adjusted to suite your own taste. With the included photo editing software, you can use a single set of tools for almost all of your work. The minimum you have to do is supply the images you wish to work with and steer the product to give you an end result. #1 - Experiment - There is a WEALTH of options available and while the very useful and well written 255 page PDF manual can explain the functions and options available, nothing beats doing things yourself to get familiar with the product and process. It's always useful to have an idea of what you want to accomplish, but the wizards and help pages can prompt you if you get a creative block. It's very quick and easy to select and drop your photos into the timeline and manually add basic transitions and effects to them (blurs, crossovers, fades, more complex) and to add titles \ text. • Drag a slide onto the timeline and it will snap against the previous one (or the time marker). • Drag one slide so it overlaps another and a smooth fade in\out will be automatically applied. • Click on the [A|B] icon on either side of the slide to choose a transition. 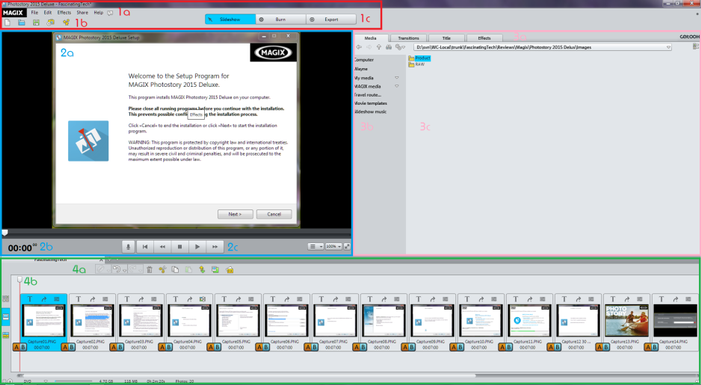 • Click on a transition in the right hand side of the UI to test the transition in the preview. 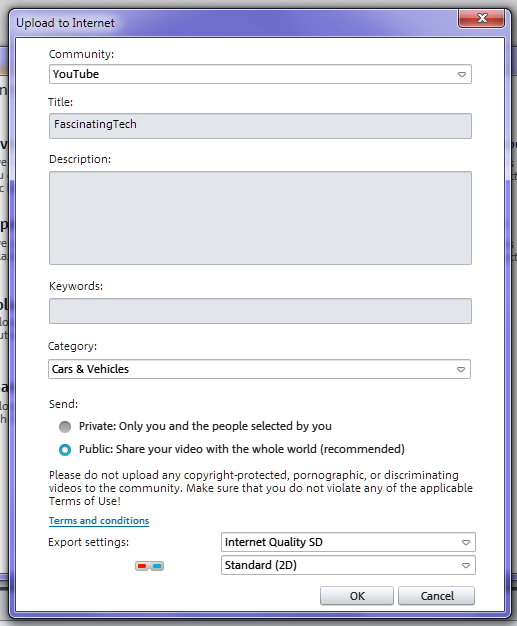 • Publish the end result to YouTube, Flikr, or Facebook, straight from the application. • Publish to YouTube or burn to physical media and share. • Change the overall colour \ tone \ hue \ Saturation of the images. • Change the exposure \ contrast \ gamma to suit the project. 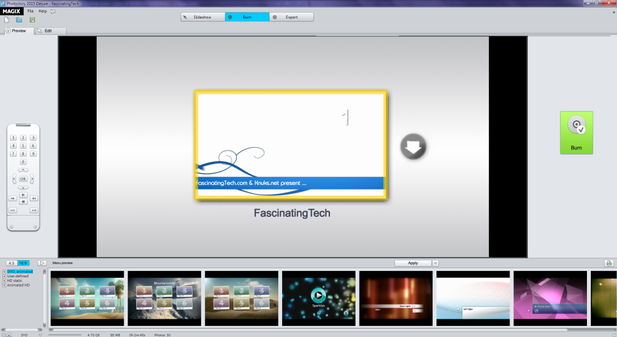 • Pan and zoom across your images during the slideshow. • Export final output in a variety of formats with lots of customisation and optimisation available dependant on the format chosen. As mentioned, this is quite a decent product - you get a lot of tools and options in one package and a pretty decent help system for when you get stuck. Most controls have keyboard short cuts (for those of us who like them) and most core functions are accessible via context sensitive mouse clicks or from the main menus. The system is divided into Create, Burn, and Export sections which are clearly differentiated onscreen to let you know what you are doing - IE, the screens look very different, although the Export section is just a series of pop-ups displayed over the main UI. The interface is neatly laid out with clear indications on what you are trying to perform. The Preview area is a nice size by default and accurately represents what is happening at that point in the timeline. The transitions are neatly grouped together as are the captions, effects and the titling functions. The effects themselves are pretty smooth and professionally executed with blends and crossovers looking particularly nice (I like 'simple and well done'). 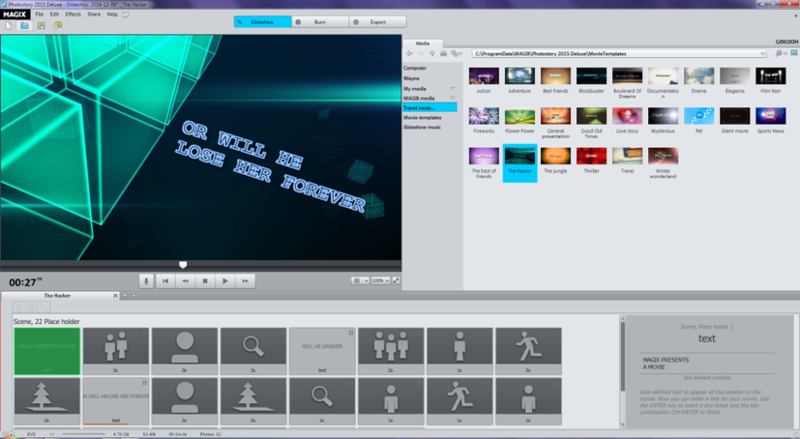 The Movie Templates are varied and well choreographed allowing the user to add in their own images and text while maintaining a well orchestrated theme. ... and some elements can be adjusted before saving. The animated route tool is functional and customisable allowing the user to add in a number of waypoints and have the system animate a car, plane, a car, or walking with varying speed. This can be imported into your slideshow as a semi-transparent backdrop (on one of your 8 tracks) with the appropriate slides and titles transitioning behind it. 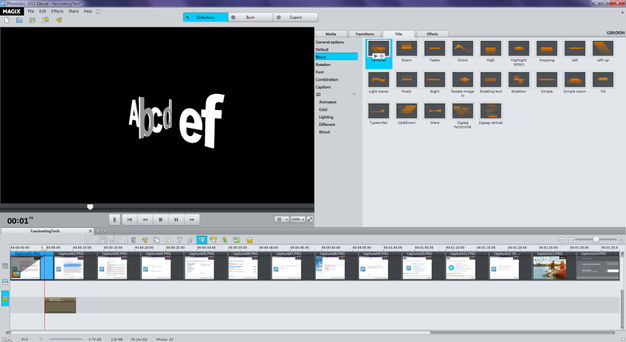 Music and sound effects are sometime overlooked when creating slideshows and presentations and the tool has a large library to draw on if you do not have any effects of your own. This does require access to a DVD Burner which, even in 2014, some people may not have access to. 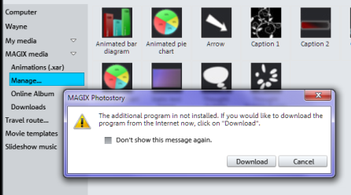 The functionality was not tested during the review so the output and manipulation \ functions cannot be reported on. The final key option allows the user to save the final slideshow to a number of 'common' locations in a format optimised for that locale. 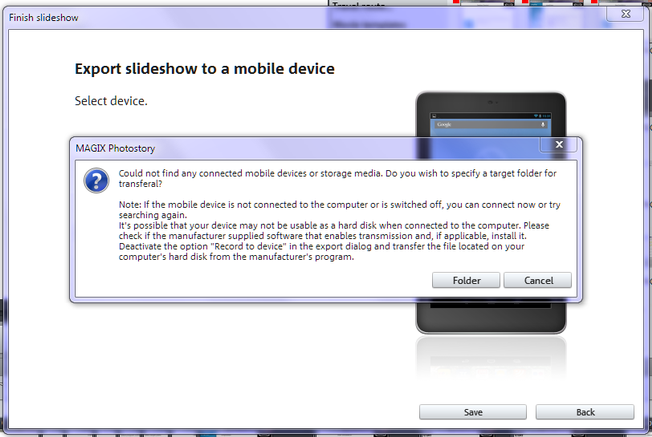 This option allows you to quickly specify the requirements for an externally viewable format for your slideshow. 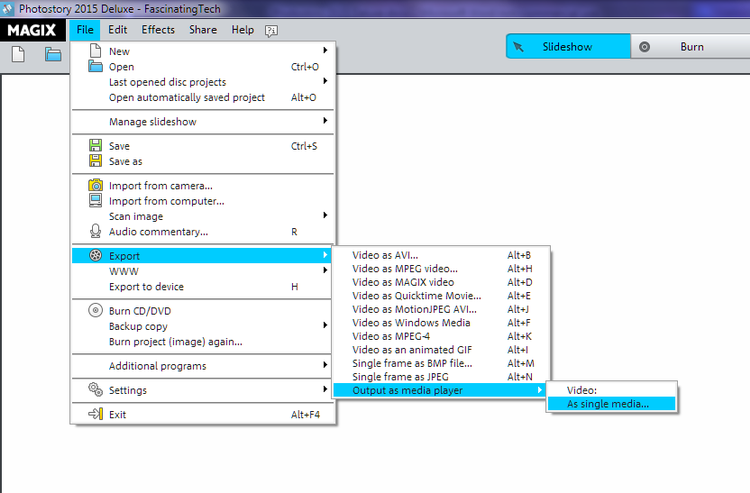 This option allows you to select from a number of pre-defined formats which are optimised for that 'style' of device. 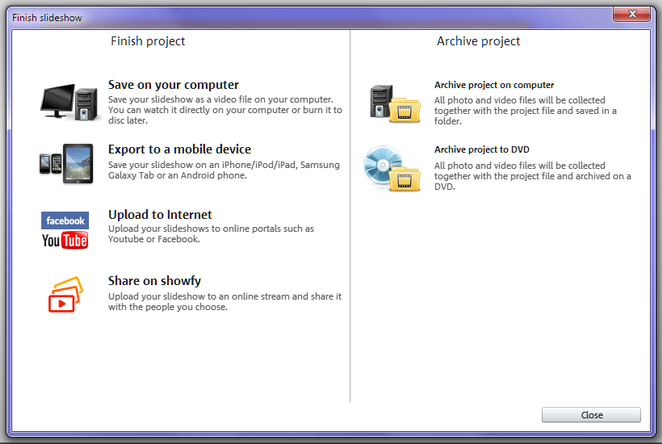 When 'saved' the system will render the slideshow appropriately and either save the file to a location on a device (if it is connected) or to a folder on the PC for later upload. 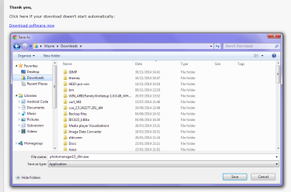 The size of the resulting file will depend on the options the system selected when generating the output, and if saved to the PC the user is required to copy the file to the connected device at their convenience. Not all mobile devices are listed but each phone or device should be able to play at least one of the generated files. This option will render and upload the final slideshow to Facebook, Flikr, YouTube, Magix Online or Showfy if you have the appropriate credentials. Each destination has a set of limited set of options that you can configure (such as YouTube keywords and quality) and provides a quick and easy way to get your files uploaded. 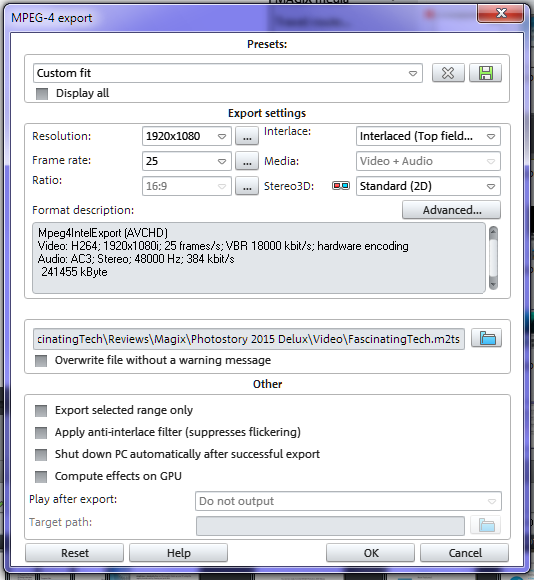 However, for finer grained control of export options, the user can select 'Export' from the main interface and have much greater control over the final output. When the application first loads it presents a full screen 'Welcome' dialogue that prompts for an initial action - Create new project, Load project etc... If escape is pressed here then the application closes. It would be useful to have the Welcome screen close but leave the main interface open. 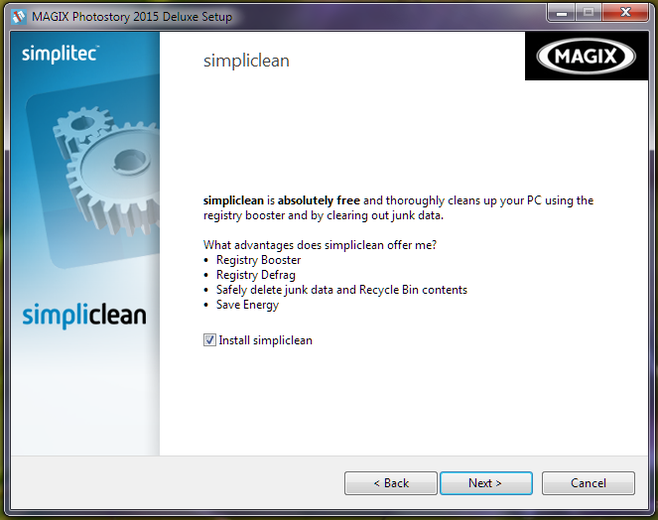 When the application launches it may display a 'Magix Software Offering' window which appears on top of EVERY other window you may have open. This is annoying. I typically have a number of applications running concurrently (especially for reviews) and there is no real need to overlay windows on top of these windows... This window has a 'Don't show in future' option which helps. There appears to be no way to set a default background slide colour. When a slide or title is added, you have the ability to select the background colour and apply it to the slide or all slides... but this affects just those items already in place - not future slides. The next image added appears on a black background. In the example video I produced, I required a white background. 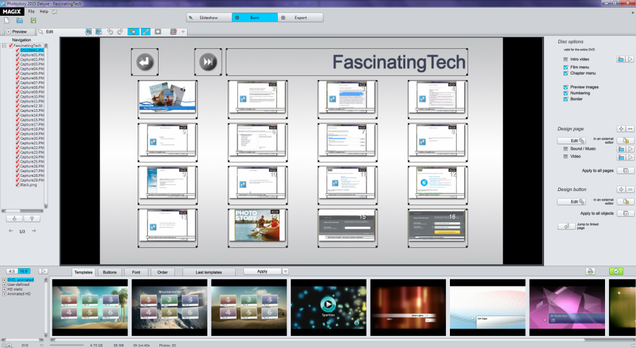 As I chopped and changed the slides I needed to change the background colour each time. This may just be an issue due to the workflow I adopted, but a simple 'default slide \ transition colour' option would be welcome. The title text may not fade \ disappear with the caption. This is observable at 13 seconds into the example video I produced where the 'Photostory 2015 Deluxe' text remains when the surrounding caption has disappeared and the 'Installation is straightforward' caption is displayed. On occasion the text typed into the caption is not immediately reflected in the preview window. When the caption is re-edited and 'Enter' pressed again, the text takes effect. Sometimes the playback starts from the beginning of the slideshow rather than where the indicator is set on the timeline. Repeatedly setting the position does not help. The music found on the example video was arranged by me using Magix Music Maker (2010 I believe) - The music was created about 4 years ago and is subject to the same copyright as the photographs, images and videos for FascinatingTech.com. Use of the music is granted free for use by FascinatingTech. If you wish to use the music for any purpose, please contact myself or the editor of Fascinating Tech first.